Isla with her Principal's Award which she won at Assembly this morning. Great work last week Isla. Donna, Keegan, Manix, and Nicholas with their PRIDE Certificates. Dorian was absent but received a PRIDE Certificate as well. On Friday each class was lucky to have some men from Coastal Rugby come and run rugby skills with each class. Room 15: Totara worked with Room 8: Miro to have a great run. Watch the video below showing the great time had and the great skills we gained. Invention Writing found on our Individual Blogs. Please keep looking at our individual blogs. This week for writing we read a book called 'Klutz Book of Inventions.' After reading and discussing different inventions we worked with Miss Carlson to create our own inventions. When we had written and edited our different inventions we worked together to present our writing. We read it out loud and drew a picture of each of our inventions. To see videos of our inventions then please click on the links to each of our blogs. You will find over the next week our videos and writing. This week we started working with different teachers to learn about what life was like in the past. 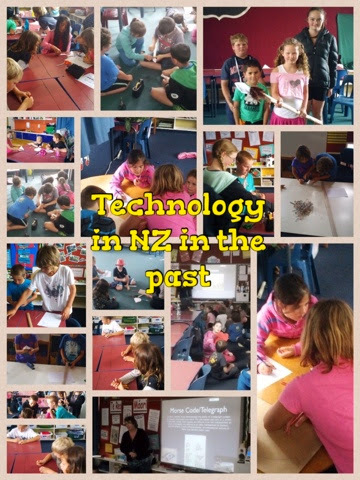 In Room 15 students have been looking into what technology was used. Here is a sneak peak into what students will be working on with Mrs Potroz, Miss Ogle and Miss Carlson. Congratulations to Ria who received the Principal's Award for Week 7. Congratulations to this weeks PRIDE certificate winners. We answered some of the questions when we found the information in the story. On Thursday we had to think about what we had read and come up with some rules for the game. On Friday we were lucky enough to go to the swimming pool and have a go at playing a game of Flipperball. See our video of us playing Flipperball. We had heaps of fun. Thank you to Miss Carlson for running the game and thank you to some of Room 14 who joined in with us. Today we were able to finish off our stories about our taonga and publish them. To share our stories with others we have set up individual blogs. If you would like to see the great work that each student is doing then please click on the links below to view their stories. Here are some more photos of the taonga that the students of Room 15: Totara have brought in to share with the class. Wednesday saw the last day of working with Rhonda from Action Post: Hockey. We played a game of 'Horse and Jockey.' When we understood the game we were able to use hockey stick to play. We had to work hard to tap the ball around the circle. 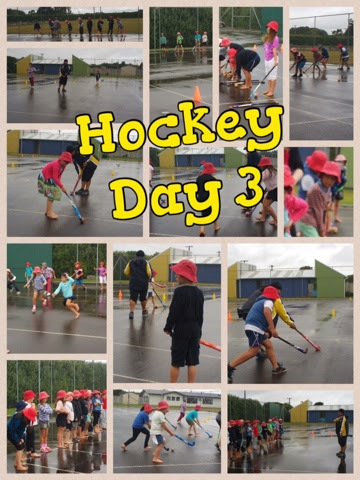 At the very end of the session we got to use all of the skills we have learnt over the last four days and play a game of hockey. Thank you to Rhonda and Mark from Action Post for taking their time to teach us some of the skills of hockey. Today we experienced day three of Hockey. We started the session playing a game of Octopus which is just like Seaweed. When we were used to playing the game we were then able to get our hockey sticks and play the Octopus. Miss Ogle and Miss Carlson were even able to get involved and had to try hitting our hockey balls out of the coned area. We have one more day of some awesome hockey. I wonder what we will do tomorrow? Over the last two days teachers have been showing their treasures to the school. We have had some students bring in their taonga (treasured thing). We will be writing about our taonga/treasure and sharing with others in the class. Watch this space as we get more taonga/treasures coming in. We will be taking more photos showing what our special items are. Today we had our first wet lunch. We were able to keep ourselves occupied. Some students decided to create a very large tower with the blocks that Miss Ogle has in the classroom. We counted all of the blocks and found that our tower used 120 blocks. The tower was so tall that we had to stand on a chair to touch the top of it. Reading: "Getting Our Hands Dirty"
For Shared Reading we read an article called 'Get Your Hands Dirty'. The article was about Royal Road Primary School and their efforts to become a "sustainable school." In the article they talked about a worm farm. During the week we talked about what we do at school. We discussed how we recycle our rubbish. We decided to show the journey our food scraps take. 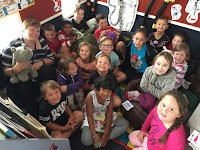 Please view our video to see what happens in room 15: Totara and our school. Today we had day 2 of learning skills relating to Hockey. After a while we then introduced the hockey stick in and used 'sticky' and 'tap tap' to get the hockey balls from one end of the court to the other. We have two more days of working with Rhonda from Active Post. We can't wait to see what we will be doing next. Principal's Award for Week 6. We would like to introduce Miss Carlson to Opunake Primary and Room 15: Totara. Miss Carlson is a trainee teacher all the way from Canada and will be in our class until the end of the term. We look forward to working with Miss Carlson to complete some great things in Room 15: Totara. Today we had Mark from Action Post come to work with all of the classes in the school. He spent 30 minutes with each class learning skills relating to Hockey. Today we focused on getting back into the activities that Mark taught us last year. We have Mark in school again next Monday, Tuesday and Wednesday. Today Room 15: Totara spent the day with Mrs Mourie and Mrs Sinclair at Kitchen Garden. The class spent part of the day outside painting rocks and pallets to put in and around the garden. We also had a chance to do some cooking. We cooked some Zucchini fritters with some ingredients from the school garden. We then got to eat the fritters at morning tea and lunch. Thank you to Mrs Mourie and Mrs Sinclair for working with us. We really appreciate having some great people to teach us about working in a kitchen and outside in the garden. Principal's Award for Week 5. This Wednesday, March 12th, Room 15:Totara are doing Kitchen Garden. To help with the costs of ingredients your child will need to pay $1 to their classroom teacher. The ladies taking Kitchen Garden are requesting some help. If you are able to assist on this day please let me know. Here is the artwork that the class have been persevering to complete over the last two weeks. They have been working diligently to complete their work to share with their parents.